It was a spectacular treat from Hog Island Bay, Virginia that we enjoyed today! The Sewansecott Oysters from H.M. Terry Co, Inc. were fresh, having been harvested on June 2nd and in my house on June 3rd and wow, what flavor! I could smell and taste the ocean and all of us thoroughly enjoyed the salty taste! These oysters are a must try. If you can't find them where you get your oysters, just call 757-442-7777 and Heather will gladly take your order. I can't believe I've been eating oysters for so long and didn't know about these. So, what did we learn today other than how great they taste and how fresh they arrive at your door? 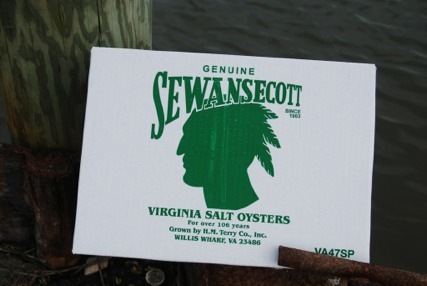 These Virginia oysters originated in 1903, under the care of Henry Terry's brand of oysters, the Sewansecott. Today, 106 years later, they are still grown and harvested in Hog Island Bay on the eastern shore of Virginia, among 80 miles of a protected ocean and wildlife reserve. The Sewansecott brand is known for dedication to ecology, biological preservation and sustainability. Their oysters are so fresh from the ocean they have a remarkable salty finish that makes them irresistible. Most of the oysters we received were medium to large in size and had a meaty, solid texture. The salty, briny finish yielded an addictive oyster. My shipment arrived around 10:30 AM but a busy day didn't allow me to open the package until 6:30 PM. They were shipped via UPS next-day air, and packaged in a nice box, covered with an ice pack. For my order, each and every oyster was alive and filled with liquor. They were simple to shuck and because of the great taste we enjoyed them as is. No lemon, no cocktail sauce, no mignonette. To learn more, see the new H.M. Terry Co website. 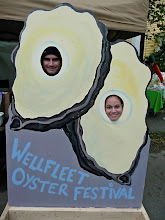 You can read about their story, and learn more about their oysters. When you place your order with Heather, tell her that Josh from Go Shuck An Oyster sent you. I promise you, you will enjoy this rare treat as much as we did. Awesome oysters! Amazing salty taste! Will buy them again!